SHANGHAI - China Life Insurance Co, the world's biggest life insurer by market value, on Tuesday revised up its 2009 net profit growth forecast to more than 200 percent from 2008, citing accounting rule changes. China Life did not give details on its 2009 earnings, but said that it posted a net profit of 10.068 billion yuan ($1.47 billion) for 2008, in a statement published in the Shanghai Securities Journal. 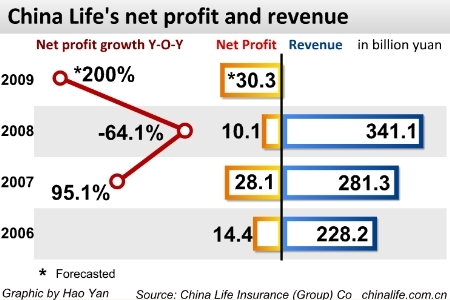 China Life previously estimated its 2009 net profit grew over 50 percent, partly as a result of a recovery in the capital markets which led to an increase in investment returns. China's Ministry of Finance revised accounting rules for insurance companies last year to bring them more in line with international standards, and China Life's 2009 earnings estimates were based on new accounting rules. Workshop becomes center of prop construction for action movies and TV. General Motors Co, Volkswagen AG and Ford Motor Co are positioning themselves to compete for return customers. Reese Witherspoon says her character Elle Woods has been ousted as the most stylish woman to come to the nation's capital by first lady. Different hairstyle different look, which one do you like best? I agree the view of this person, but not whole as what she/he said. I think English cannot be a threat to Chinese.